Added to Notables Rear Admiral Earl LeRoy Sackett (1897–1970) was awarded the Navy Cross for heroism in the Second World War as commander of the USS Canopus in the Philippines. Added to Notables Colonel William Sackett (1838–1864) fought in the Battle of Gettysburg, and was mortally wounded in the Battle of Trevilian Station. Transcriptions of the World War I draft registration cards are being made by members of the Sackett Family Association. The project started 25 Nov 2013, and the total number of Sackett records to be transcribed is about 660. Members of the Sackett Family Association are working on a project to transcribe the US World War 1 Draft Registration Cards for the 600+ Sacketts who were registered for the draft. The project was launched 25 November 2013. Records transcribed so far are at US, World War I draft registration cards 1917–1918. Progress chart updated 26 July 2014 (project completed). As we remember the fallen of the World Wars and other conflicts, Association member Charlotte Wruck sends a most unusual death certificate: that of Florence (Barnes) Marr, wife of Sackett descendant Sidney Marr. The cause of death, recorded on a further document, was "cerebrale apoplexie". Sidney and Florence were living in Guernsey at the time of the German invasion and subsequent occupation of the island during the Second World War. They were among a large number of English-born islanders deported to Germany on Hitler's orders in reprisal for various British actions elsewhere. 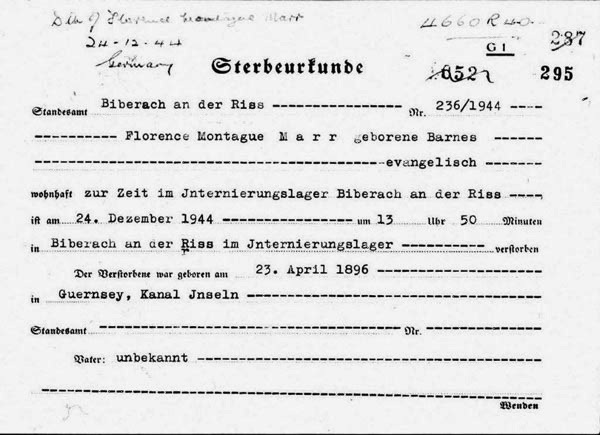 Sidney was eventually released and, after the war, married Violet Burge, also an internee at Biberach Camp and a friend of Florence's.